We are waiting to hear if “Gunning Down Grizzlies” will begin on Sept 1 in Wyoming. Judge Dana Christensen will rule on Thursday Aug 30, for or against the grizzly. Please watch this short film, and follow with Take-Action. 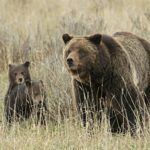 Call the Wyoming Office of Tourism, Wyoming Governor Mead, Interior Secretary Zinke, Wyoming Game and Fish Commission, Wyoming Game and Fish Department, and your U.S. Representatives and Senators! Please, Please don’t shoot these beautiful animals for the purpose of sport, these animals have every right to live and take care of there kids. I am a Californian and will take action by contacting my congressman. Will that help?